Trying to describe The Wicker Man isn't easy. Is it a horror movie? Clearly not. Is it in some way a supernatural thriller? Again no. In fact, the film, although lumped in with fantasy and horror genres is unlike anything else - and there's a part of its charm. It's also a smart film with a clever script, great characters, some superb performances and just the right amount of suspense. But best of all is the ending. Do the good guys win? That depends on who you regard as being on the side of good. In the end, the sun rises for the islanders as they deliver God's sole representative on Summerisle to a fiery, pagan death. Ouch! The idea of having an isolated island where its inhabitants still follow the old religion is pretty promising, but you wouldn't bet on it producing a film of this calibre. You actually feel that what you're watching, at times, is so close to real that it looks almost like a documentary. Would that be the power of the old religion infused into each frame? You couldn't say for sure it wasn't. This release comes complete with some excellent extras. You get a longer version of the film - the reason for its existence is covered in some fine documentaries on disc two. In fact, by the time you've watched the contents of both DVDs you really feel you've got inside The Wicker Man - although not literally as that would be a tad uncomfortable. And if you like conspiracy theories then you'll love watching Christopher Lee (the Lord of Summerisle) explain his views on why the project almost failed. Great stuff. And finally, my least favourite part of the film - its music. I know some people love it but I consider it too clean and precise. It should have been earthy and driven rather than slightly prissy. But, for those who like the score, there's a bonus disc of it, lovingly cleaned and restored. As a stand alone item it's very good, just not to my taste. 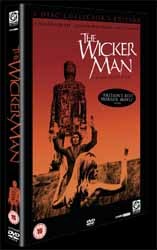 In 2004 the magazine Total Film named The Wicker Man the sixth greatest British film of all time. I think this is an underestimation of the movie. As for the remake, it won't be making anyone's top ten list, unless its of worthless ventures.